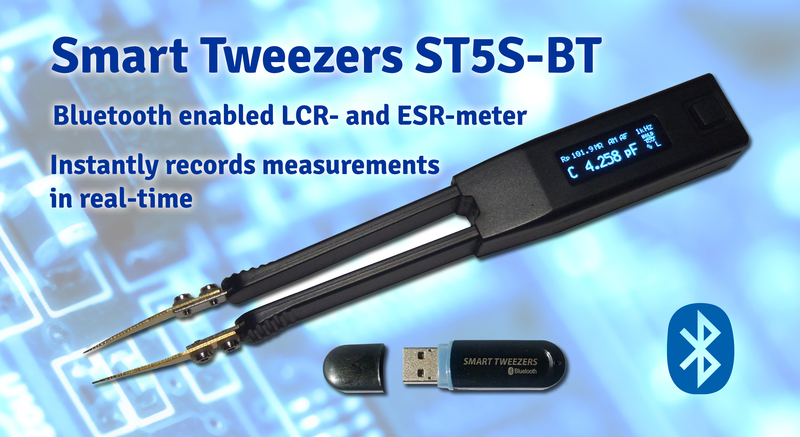 The Smart Tweezers ST5S-BT has been updated to include the ability to send and receive information to and from the device. The previous model allowed device only to be sent from the Smart Tweezers device to the communication software; the update allows software to control the device by sending test settings. Smart Tweezers with Bluetooth is based on the ST-5S model with the same features and basic accuracy of 0.2%, while also offering the ability to remotely record measurement data. The device connects to PC, tablets and smart phones with iOS and Android platforms. To connect to PC, the Bluetooth USB receiver stick is required. The device is then able to communicate with software such as NI LabView, Windows’ Smart Tweezers Bluetooth Utility and dedicated apps. When connected to apps, users can set custom profiles using previous measurements or from scratch. The profiles set parameters that components must measure between. When a measurement is completed, the program will either determine if the component meets these specifications and is marked as red or green. Profiles can include the type of component, measurement values or secondary values. 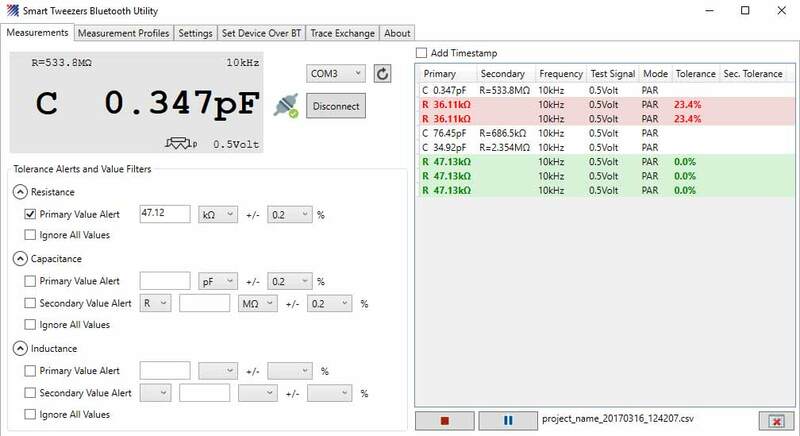 Profiles are also able to set device test settings like frequencies or test modes; these settings are sent to the device. Depending on the software used, the measurements can be saved to Excel compatible files or databases for other file types for later review or processing. The ability to remotely record measurement values in real-time is essential for jobs where quality control is required. Smart Tweezers ST5S-BT2 receiver stick uses an FTDI bridge that creates a virtual RS232 serial port for connection. 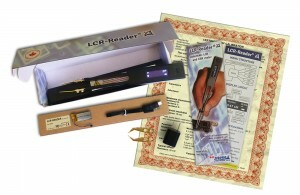 The newest model of Smart Tweezers Bluetooth is available in the LCR-Reader Store. Siborg is hosting an end-of-January sale with up to 20% off devices and accessories i nthe LCR-Reader Store and Amazon Sales Channels. The sale begins on January 18th 2017 at 12:00 AM and end on January 31st at 11:59 PM EST. 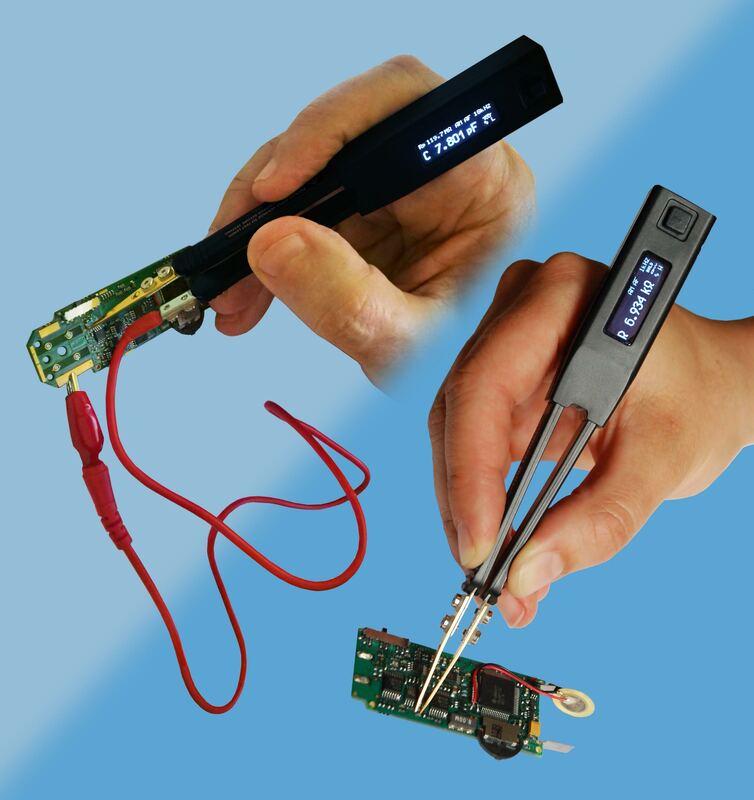 The sale includes LCR-Reader and Smart Tweezers (including Smart Tweezers with Bluetooth) devices and task kits, as well as LED Test Tweezers, Kelvin Probe Connector for Smart Tweezers and LCR-Reader, and SMD Multimeter Test Tweezers. Go to the LCR-Reader Store or Amazon Sales Channels in USA, Canada and Europe before the end of January for your chance to take part in this sale! Until September 30th, 2016, Siborg is offering their LCR- and ESR-meters and Test Tweezers devices for 10% off in their online sales channels, including the LCR-Reader Store, Amazon.com, Amazon.ca, and Amazon.co.uk. This sale includes all LCR-Reader and Smart Tweezers task kits, as well as the other tweezer-like devices like LED Test Tweezers, SMD Multimeter Test Tweezers and LCR-Reader Probe Connector. The new model of Smart Tweezers, the ST5S-BT that allows users to connect and remotely record their measurement values in real-time over Bluetooth connection is also on sale. 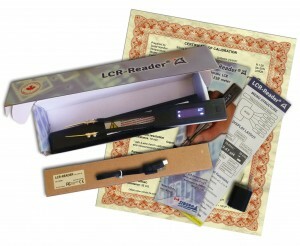 Now is the perfect chance to pick up an LCR-Reader Professional Kit. This kit includes a pre-calibrated LCR-Reader, NIST traceable calibration certificate, charger and micro-USB cable, spare bent tweezer probes, an extra battery (only available in the LCR-Reader Store) and manuals. The Smart Tweezers ST5S-BT is a Bluetooth enabled ST-5S model with the same features and functions with the added function of remotely recording measurements in real-time. The ability to record measurements is efficient for those who require to record all measurement values and to create a quick reference of previous measurements. This is explained as the main impedance value and its typle (Capacitor 1.398nF), secondary value and type, test frequency, test signal level, measurement mode (S for serial) and 4 reserved values. The attached photo shows Tera Term software receiving the data. The data sent can be saved into a file or, when using NI LabView®, saved into a database to be processed later. The ST5S-BT is based on the the ST-5S model and offers the same features as the latter. Extensive menus for customized measurements including offset subtraction, holds and nulls, etc. Siborg is offering two different packages for the ST5S-BT in the LCR-Reader Store, one with the USB receiver stick and one without . Please note when ordering, the USB receiver stick is required for use with computers and NI LabView®. 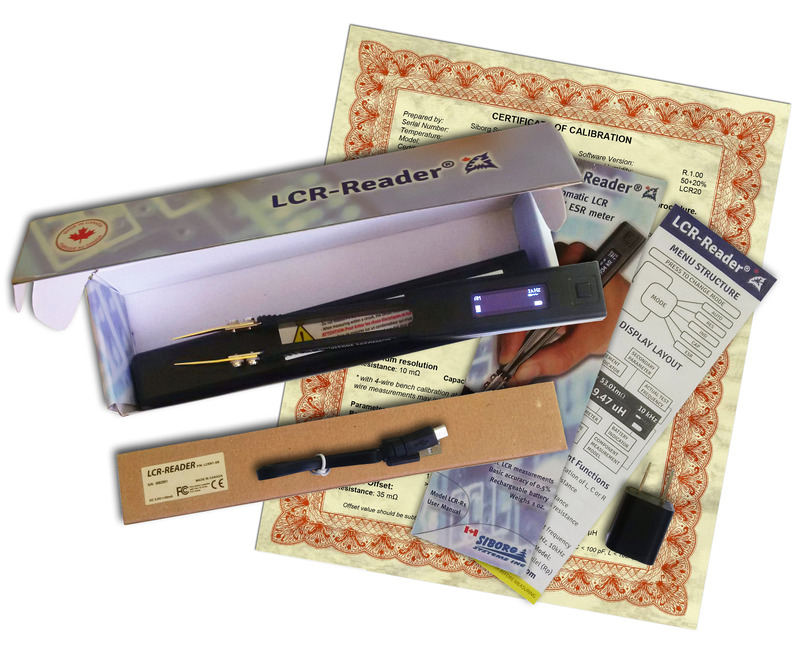 Siborg has recently added the LCR-Reader Probe Station to their LCR-Reader Store inventory. The LCR-Reader Probe Station allows LCR-Reader LCR- and ESR- meters to preform full PCB probing and measure components outside of the tweezers’ allowed sizes. The 60 cm shielded two-wire connection virtually eliminates parasitics from the wires, is easy to install and comes with seven attachments. Including a spade connector, alligator clips, long and short pin-probes, and 4 mm multimeter jack plugs. 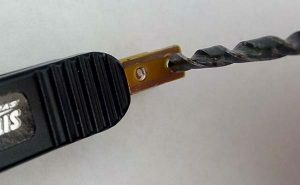 Easy to install and simple to use; remove one of LCR-Reader’s gold-plated tweezer probes and replace with the small PCB on the connector cable, making sure that the gold strips on the flex cable and the connector match up. Tighten the screws, select the best attachment for the task at hand and start measuring. 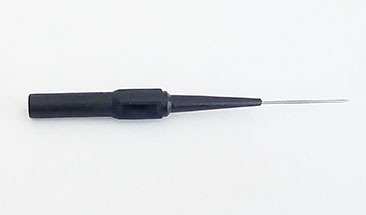 The attachments screw into the Probe Station’s universal connector. 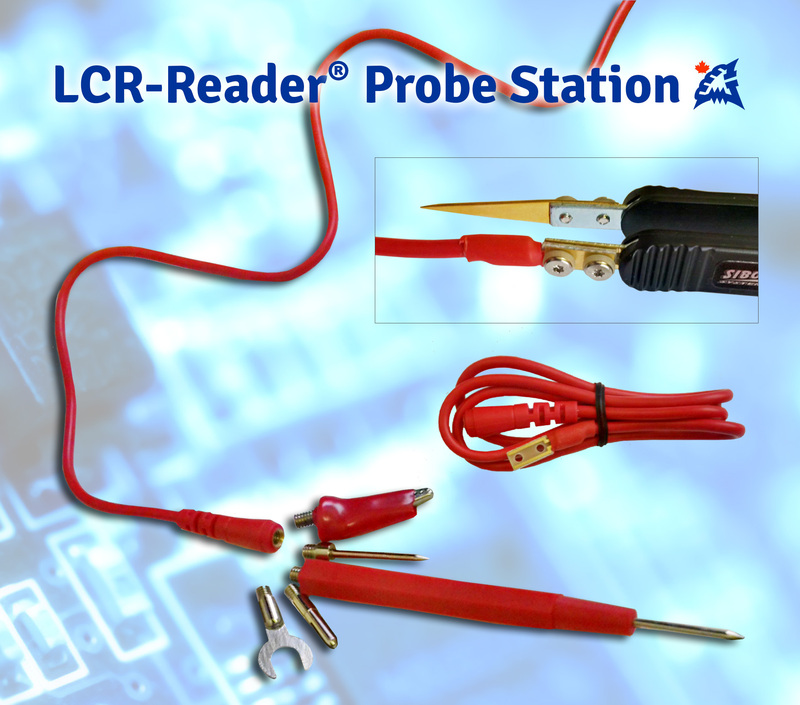 The Probe Station works with LCR-Reader and Smart Tweezers models with removable tips. The device is now available in the LCR-Reader Store for $24.99 US. Around mid-May, Siborg Systems Inc. will begin offering a new model of Smart Tweezers, the ST5S-BT. This new model allows users to record measurements remotely and in real time using Bluetooth technology. The ST5S-BT is based on the ST-5S and will offer the same features, functions and 0.2% basic accuracy. The Bluetooth feature allows connectivity to the NI LabView® environment, with the eventual capability to connect to Windows, iOS and Android compatible apps. The ability to connect and record results will allow users to be more efficient and control past measurement values. This string of values represents the device’s display when the measurement was taken: “C” impedance value type (capacitor) and its value (1.398nF), “R” secondary impedance (R) and its value (3.461kR), the test frequency (10kHz), at the test signal level of (0.5V), followed by the measurement mode (S for serial), and 4 reserved values. The information is then sent to the port and can be recieved by any communication software, such as free Tera Term software. 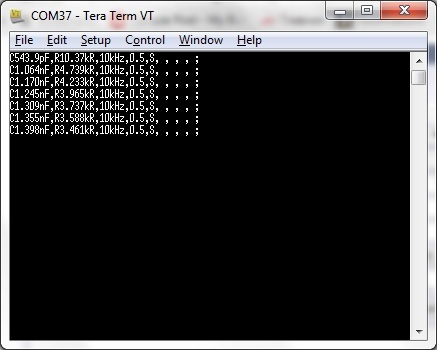 This image shows the Tera Term terminal receiving data from the ST5S-BT. This data can be save into a file or documented as neededd. With the LabView software, the computer would be able to process and store the data in a database. The ST5S-BT will be available in mid-May 2016 in the LCR-Reader store and possibly Siborg’s amazon sales channels in the future.